The Vice President, Shri M. Venkaiah Naidu presenting the National Award to Teachers  2016, on the occasion of Teachers Day, in New Delhi on September 05, 2017. The Union Minister for Human Resource Development, Shri Prakash Javadekar, the Ministers of State for Human Resource Development, Shri Upendra Kushwaha, Dr. Satya Pal Singh and the Secretary, Department of School Education & Literacy, Shri Anil Swarup are also seen. 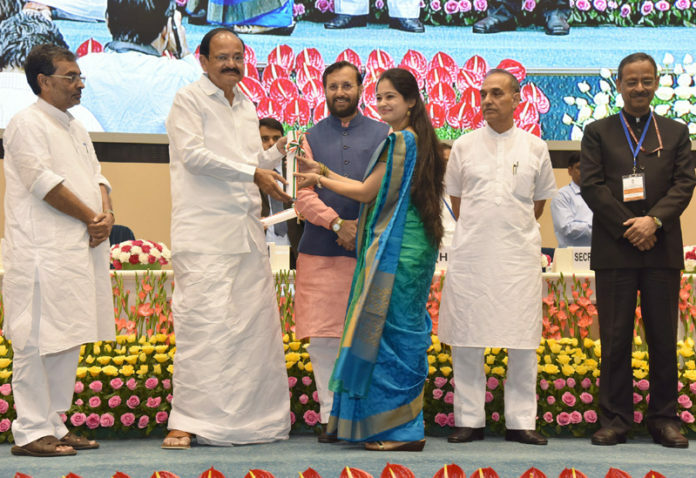 New Delhi: Vice President, Shri M. Venkaiah Naidu presented the National Award to Teachers – 2016 on the occasion of Teachers’ Day, in New Delhi today. Shri Venkaiah Naidu also launched DIKSHA portal, a national digital infrastructure for teachers. DIKSHA will enable, accelerate and amplify solutions in the realm of teacher education. Speaking on the occasion, Shri M. Venkaiah Naidu remembered Dr. Sarvepalli Radhakrishnan, an educationist and scholar par excellence. He congratulated the winners of the awards for the invaluable services rendered by them. He said this felicitation to teachers is inspiration to others to perform in the future. He emphasized on the importance of mother tongue and we must respect it. He also said that mediocre teacher tells, good teacher explains, superior teacher demonstrates and a great teacher inspires. A teacher should have an ideal behavior which can leave direct impression on their students as values are caught and they cannot be taught. On the occasion Shri Prakash Javadekar greeted one crore teachers of the country. He said that the society which respects the dignity of the teacher is a progressive society, the one which is ours. And our teachers should perform efficiently so that society can value them as they were valued in our ancient teaching system. He told that the ministry is continuously making efforts in the direction of quality education for all i.e “Sabko Shiksha aur Acchi Shiksha”. He also reiterated the message of Prime Minister Shri Narendra Modi to teachers –“teach to transform, educate to empower and learn to lead”. Minister of State for Human Resource Development, Shri Upendra Kushwaha congratulated the winners of National Award to Teachers – 2016. He said to overcome the challenge to provide quality education to each and every child of our country, the Government of India and teachers should work collectively to achieve it. Addressing on the occasion Minister of State for Human Resource Development, Dr. Satya Pal Singh said whatever we are today is because of our teachers. Teachers have that capacity to make a New India by inculcating knowledge, values, wisdom in the students who are the future of this country. Shri Anil Swarup, Secretary, Department of School Education and Literacy gave vote of thanks on the occasion. The award carries a Silver Medal, Certificate and Rs.50, 000/- as award money.